If you're a true American, you keep a tub of grated parmesan cheese in the back of your fridge, waiting to instantly boost any bowl of Chef Boyardee. But here's the problem: that parmesan may be closer to termite food than you'd care to think. 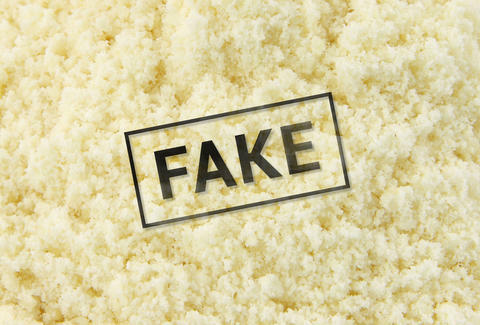 According to a report in Bloomberg Business, the Federal Drug Administration has cracked down on Castle Cheese, Inc. and its practice of adulterating its grated parmesan cheese with cellulose. For the uninitiated: cellulose comes from wood pulp, helps prevent cheese from clumping, and is safe to eat in small amounts -- 2 to 4 percent of the entire product. The problems arise when parmesan purveyors begin cutting the cheese (heh) to extreme degrees. Think about everything TV has taught you about dealing cocaine, and then replace the cocaine with cheese. Because after all, it's as addictive as crack. Less than 40 percent of the product was actually a cheese product. The FDA didn't go lightly on Castle either, as company President Michelle Myrter is set to plead guilty to criminal charges, facing a year in prison and a $100,000 fine. That's a lot of cheddar (money). Generally speaking, the FDA spends its time making sure the food you eat is safe -- rather than going after companies who defraud their customers. But as evidenced by a $16 billion, worldwide scam where mobsters adulterate olive oil with slag ingredients, there's plenty of money to be made from peddling inferior products to John Q. Cheeseeater. That earlier, ham-fisted cocaine comparison applies: The pure stuff is plenty great (if you love drugs!) and will net you a hefty profit if you sell it pure. But you can inflate those profits by adding fillers, and most consumers won't know the difference. And now, apparently, duping your customer with a cut-rate product will lead to jail time, too. Ryan Craggs is Thrillist's Senior News Editor. He's makes a mean spaghetta alla carbonara. And now he's pretty sure the secret is in the wood pulp. Follow him @ryanrcraggs.